You may wish to see the other pages on Side first: 1. The Walls, 2. The Harbour Quarter and 3. The Theatre Quarter. 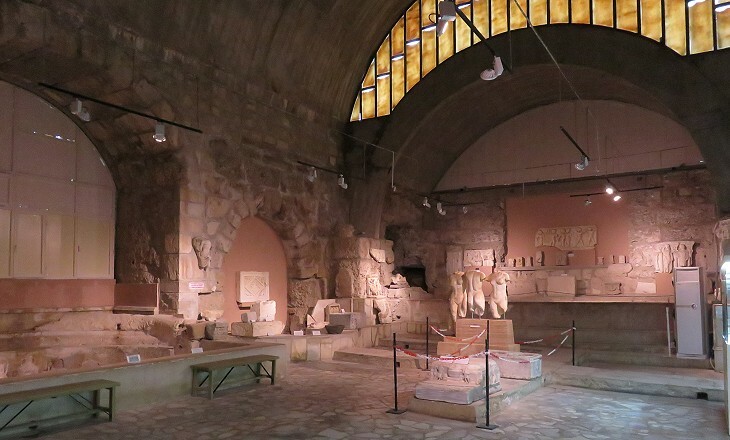 The Baths are located near the Commercial Agora and they were redesigned in the Vth century AD. Their halls and a nearby garden house some interesting statues and reliefs found in the town. 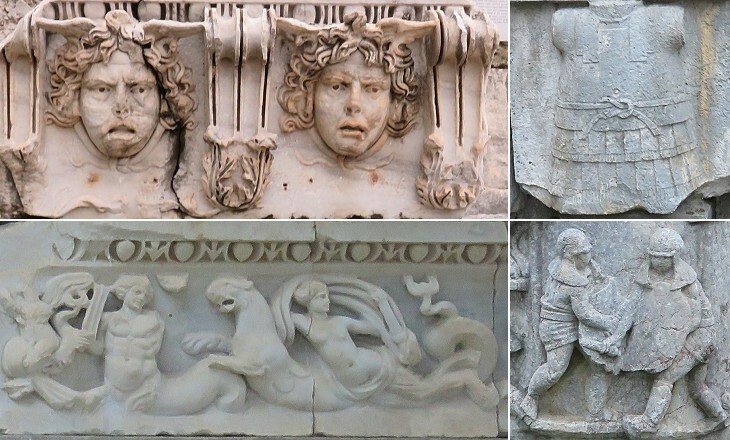 Sculpture flourished in Asia Minor, especially in the IInd century AD. Most of the statues portraying gods or mythological subjects were copies after inferred originals of the 5th century BC. 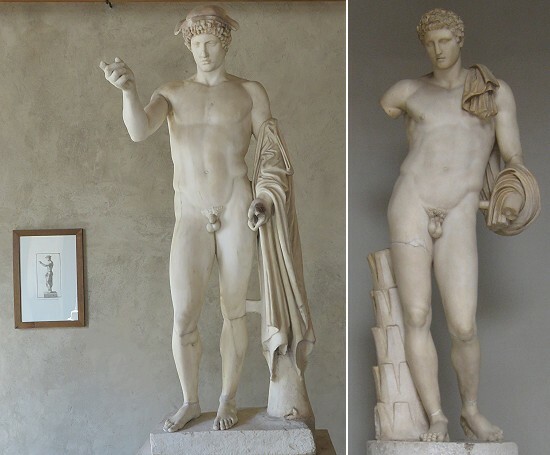 Hermes was the God of Trade (in the statue at Side he holds a purse and he wears a "chlamys", the short travellers' cloak) and of Boundaries (he stands next to a Herma, a boundary marker). 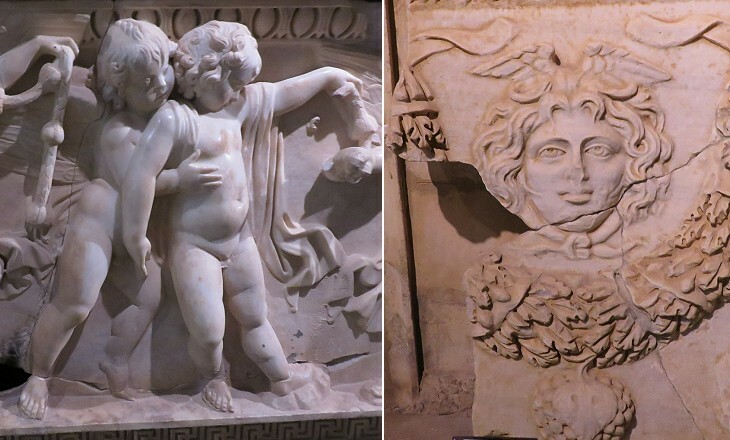 That at Side recalls two other famous statues of the god which were found in Rome: the Ludovisi Hermes and the Belvedere Hermes (it opens in another window). 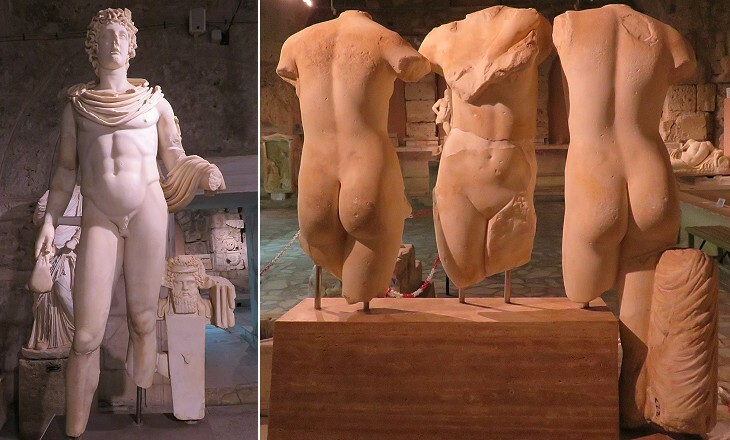 A great number of statues have been found in the ancient towns of Asia Minor. 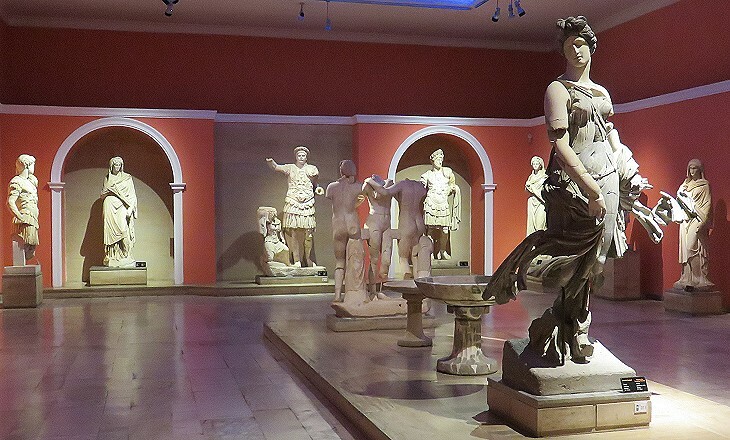 At Perge in particular archaeologists found large statues of the Olympian gods and of Roman emperors and their wives (now at the Archaeological Museum of Antalya - see one of its halls in another window). Perge is very near Side where however not as many statues have been found, although we know that the theatre and the State Agora had many niches housing them. 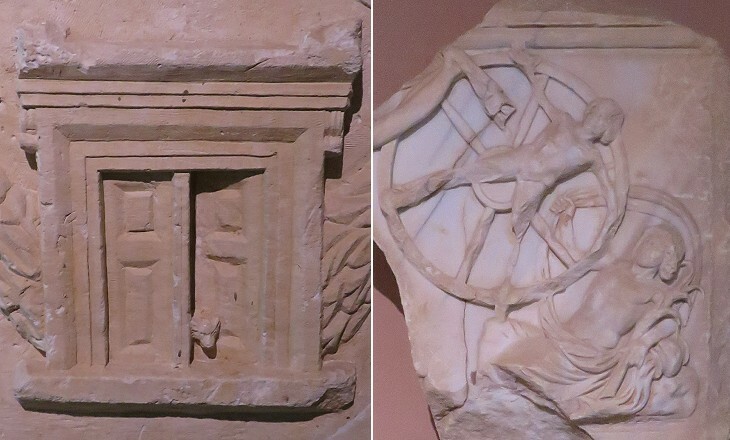 This relief shows the level of skill achieved by some sculpture workshops of Asia Minor (e.g. 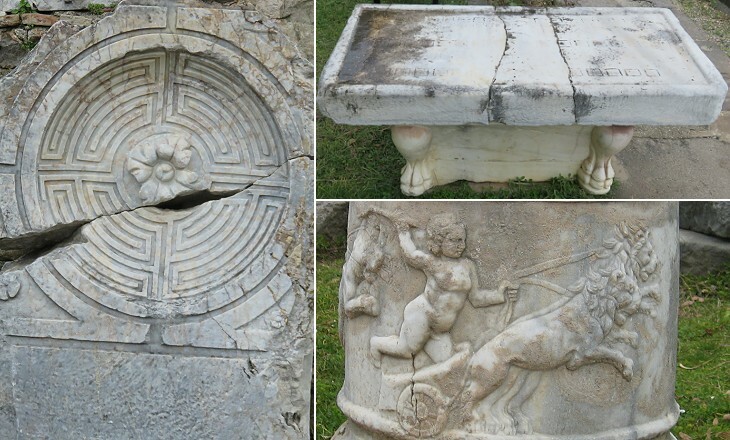 at Afrodisias) in the production of sarcophagi which were then sold in other towns and even shipped to Rome. 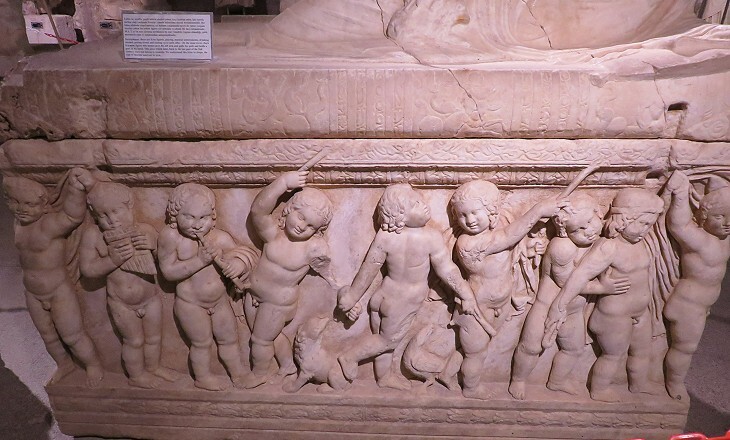 The relief is very similar to that on a sarcophagus found at Porto, the artificial harbour of Rome, which you can see in a page covering sarcophagi with a lid showing the dead attending a banquet on a couch. The scene on the front side of the sarcophagus is full of life, but that on the short side is pervaded by a sort of melancholy. The child on the left seems to be comforting the other one who looks sad. Heads of Medusa, whose name means guardian, were a widespread decoration motif for sarcophagi. Their purpose was to turn away evil influences and perhaps to scare potential looters. A door on a sarcophagus represents the passage to the world of the dead. When it is ajar it indicates that we do not know what is behind it. Cerberus, a dog usually portrayed with three heads, was one of the guardians of the underworld. Ixion was a predecessor of St. Catherine of Alexandria in being tortured by a wheel. Ixion planned to seduce Hera who, he guessed, would be glad of a chance to revenge herself on Zeus for his frequent unfaithfulness. Zeus, however, reading Ixion's intentions, shaped a cloud into a false Hera with whom Ixion, being too far gone in drink to notice the deception, duly took his pleasure. He was surprised in the act by Zeus, who ordered Hermes to scourge him mercilessly (..) and then bind him to a fiery wheel which rolled without cease through the sky. Omnia vincit Amor; et nos cedamus Amori (Love conquers all, and let us surrender to Love). Virgil - Bucolica: Book X: line 69 - translation by John Dryden. A pair of lions drawing a chariot under the guidance of Eros is a symbol of the power of Love which is able to subdue mighty and savage lions. It refers to Eros who vanquishes everything. ... for the last two thousand years it has been the fashion to dismiss the myths as bizarre and chimerical fantasies, a charming legacy from the childhood of the Greek intelligence, which the Church naturally depreciates in order to emphasize the greater spiritual importance of the Bible. Yet it is difficult to overestimate their value in the study of early European history, religion, and sociology. This is even truer when we think about the development of arts which Greek myths provided with an incredible array of subjects. 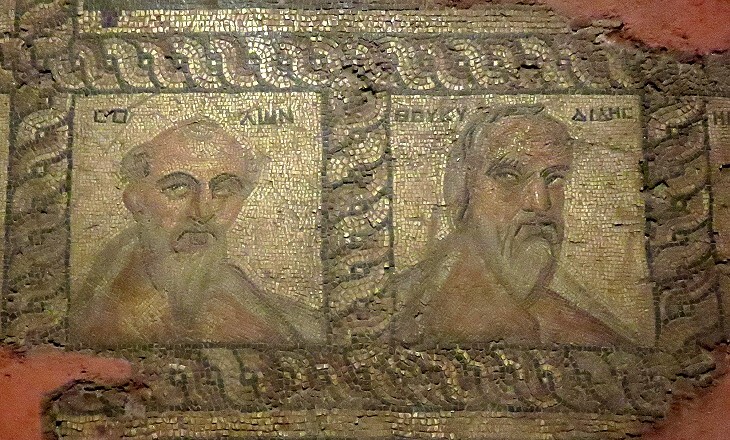 The Museum does not contain interesting mosaics, but some of them were found in locations very near Side and were moved to Antalya. The image used as background for this page shows a detail of a relief in the Museum. Move to 1. The Walls or to 2. The Harbour Quarter or to 3. The Theatre Quarter.